Charlottesville has gone downhill a bit since The Waltons: the town where John Boy negotiated his first bank loan, Jim-Bob learned about his dead twin brother, and grandma and grandpa once got stranded in a snowstorm, has become a place of street-brawls, swastikas, Nazi salutes, hatred and murder. 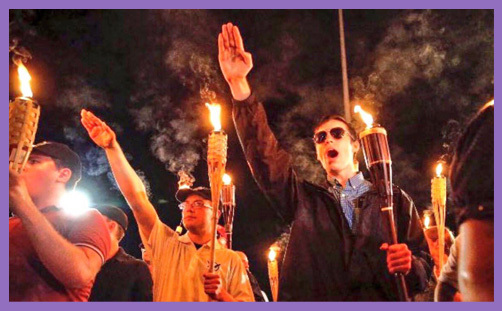 White supremacists have descended upon the gateway to the Blue Ridge Mountains of Virginia, not so much on the trail of the lonesome pine as to rail against the loathsome swine – ie, the black-skinned, brown-skinned minorities; atheists, Muslims, Jews and other non-Christians. Basically, anyone who is non-white and non-Christian is an ‘alien’ intent on ‘invasion’ to ‘take away the freedom of the masses’, and this must be resisted at all costs. And so they gathered with their Klu Klux Klan torches and neo-Nazi banners, chanting ‘White lives matter’ interspersed with ‘You will not replace us’ and ‘Jew will not replace us’. They say they want to realise the Trump prophecy to ‘Make America great again’, so they pledge to ‘take our country back’, though back from whom isn’t quite clear. What is clear is that the proposed removal of a statue of Confederate General Robert E Lee from a Charlottesville Park has become an excuse for the assertion of a very ugly identity. Some revel in referring to it as ‘right wing’, as though the KKK, Nazi militia and assorted Alt-Right fascists who rail against the political, economic, and media elites are just a more robust expression of Reagan-Thatcher ideology of individual liberty, free markets and small-state conservatism. A ‘Unite the Right’ rally isn’t an a assertion of free-speech or a declaration of Christian morality: it is purposely provocative and intentionally violent. They are defending their heritage, as they see it, from the black-brown-Muslim-favouring-PC-identity politics of the liberal-left. If they don’t engage in some urgent ethnic cleaning, they will themselves be cleansed from the land of the free and the home of the brave. The things that make for peace are hidden from their eyes (Lk 19:41f). An American citizen who has no understanding of community beyond homogeneous groups of the white-skinned and like-minded has no grasp of American history, its constitution or society. Black and brown people are also heirs to the American dream, and so are atheists, Muslims and Jews. The American citizen who will not tolerate ethnic, racial and religious diversity, but who chooses instead to stoke division and incite hatred, cannot be a Christian of any sort, for the impulse of holiness is toward reconciliation: ‘Blessed are the peacemakers: for they shall be called the children of God‘. (Mt 5:9). From the moment of Genesis, when ‘God created man in his own image, in the image of God created he him‘ (1:27), racial differences haven’t merely been issues of psychological tolerance: God’s image is to be found equally in the white American, the brown Pakistani, the black Kenyan and the yellow Chinese. Imago Dei is common to humanity; it is not the sole preserve of the Judæo-Christian tradition. And from the moment St Paul declared: ‘There is neither Jew nor Greek, there is neither bond nor free, there is neither male nor female: for ye are all one in Christ Jesus‘ (Gal 3:28), all barriers to racial equality were eradicated: no one is excluded from God’s plan of salvation, and no one ought to be excluded from the social and cultural capital that is essential for happiness and flourishing, which is the Christian vocation on earth – to be salt and light in the world. We are called to ‘contend for the faith‘ (Jude 1:3), and that means we must ‘Learn to do well; seek judgment, relieve the oppressed, judge the fatherless, plead for the widow‘ (Isa 1:17). That doesn’t stop at the black-skinned widow or the Muslim orphan, for then Christians simply deepen the disparities and reinforce the despair, thereby becoming part of the problem. We are not here to make our own fate, but to die to self and to serve. It is not possible to read the United States Declaration of Independence alongside Scripture – Old Testament and New – and to conclude that ethnic cleansing is a justifiable response to any political grievance. The only solution to a deeply divided society is for people to work day and night for solidarity, reconciliation and peace; to feed the poor, heal the sick and house the homeless. That involves giving children a good education, helping people trying to find work, and ensuring they can afford basic healthcare. We can argue over ways and means, but there is no space in this mission for those who preach the privilege of rich white Christians over poor black ones; those who chant ‘We don’t need you’ and the racist refrains of marginalisation. The rejected sense their worthlessness, and it is already profound without compounding it with the depression and despair of hate and isolation. What type of American condemns whole groups of people to lives devoid of meaning simply because of their skin colour? What type of Christian marks out anyone for the nihilism of hopelessness and oppression simply because of their religion? Interdependence is a fact of human life: respect and reciprocity engender social, economic and cultural flourishing. Men and women who depend on and love one another foster fellowship, freedom and the creative capacity which sets man apart from the beasts. This is the good life: it is the American dream. The white supremacists of America who profess to be Christians misunderstand or misconstrue this. Far from being morally righteous and patriotic, they are anti-democratic, anti-rights, anti-liberty, anti-opportunity and anti-equality. They are, in the final analysis, neither American nor Christian.